Interstate 480, better known as the Embarcadero Freeway, connected I-80 (San Francisco-Oakland Bay Bridge) with Downtown San Francisco via a double-decked freeway that followed today’s Embarcadero. The only section that was constructed opened in 1959, and it was signed as I-480 between 1959 and 1965. The Embarcadero Freeway consisted of a series elevated structures, including ramps to First and Fremont Streets, Mission and Main Streets, and Battery Street / Broadway along northbound. Entrance ramps joined southbound I-480 from Sansome Street / Broadway and Mission and Beale Streets. According to the 1964 official map of California, the ultimate planned route of Interstate 480 continued northwest past the Broadway exit to meet U.S. 101 and I-280 near the Golden Gate Bridge. The freeway would have continued along the Embarcadero to the vicinity of Lombard Street, then follow Lombard Street and Richardson Street west to the foot of the Golden Gate Bridge. There would have been a major interchange at the south end of the Golden Gate Bridge, connecting I-480 to northbound U.S. 101 and southbound I-280. 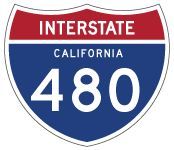 At that time, Interstate 280 was proposed to follow California 1 on a corridor roughly parallel to Seventh Avenue and Park Presidio Boulevard. Some maps even showed I-480 as the designation of the unconstructed section of I-280 between the Golden Gate Bridge approach and the interchange joining California 82 with I-280 to the south. However, such grandiose plans never came to pass. A freeway revolt in the mid-1960s caused most freeway construction within the city to grind to a halt. The majority of the freeway for I-480 was never built due to opposition from the San Francisco City Council and many residents of the “City by the Bay.” Interstate 480 was downgraded to California State Route 480 because the Embarcadero Freeway was truncated at the Sansome/Battery Street couplet near Broadway in 1965. The northern end of Interstate 280 was also shifted toward the San Francisco-Oakland Bay Bridge. I-480/SR 480 was one of several double-decked freeways in the San Francisco Bay Area. Others included parts of U.S. 101 / Central Freeway and the old I-880 / Cypress Viaduct that collapsed in 1989. Today, only I-280 remains double decked for a short stretch northeast of U.S. 101. The upper deck carried southbound SR 480, and the lower deck carried northbound traffic. 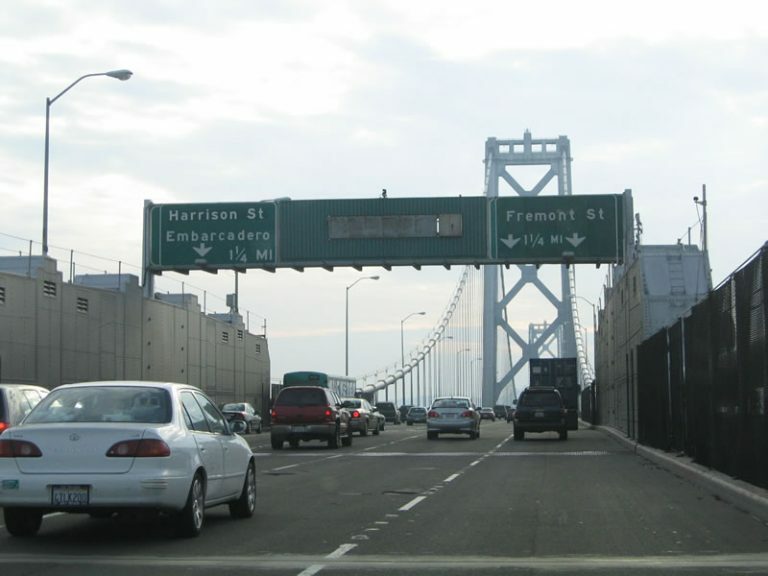 Featured in a segment of the acclaimed 1983 movie Koyaanisqatsi, the Embarcadero Freeway was seen as an enigma, exemplifying the concept of “world gone mad.” The film featured a complete tour of the northbound freeway from the Bay Bridge north to Broadway at high speed. The Embarcadero Freeway obstructed views of the waterfront, and its two levels dominated the skyline of the city as seen from the bay and Yerba Buena Island. Although it served a key function in moving traffic through Downtown, it came at a price of cutting off the city from the bay, and it also left the waterfront largely ignored. Citizens also complained about the asethetics of the structure. The San Francisco city council worked to get the freeway condemned to restore and redevelop the waterfront. A city council vote in 1985 helped to move in that direction. Although some think that the Embarcadero Freeway collapsed in the 1989 earthquake, in actuality SR 480 only suffered minor damage. However, the cost to retrofit the structure at the time was enormous. The state took action in 1991 by tearing down the Embarcadero Freeway and beginning the process of redevelopment. The former freeway corridor was repurposed with a tree-lined boulevard, light rail, and walkway. This nonreflective, button copy sign for Fremont Street along I-80 (James Lick Skyway) westbound concealed a backlit, light green sign underneath that used to display: Interstate 480 Embarcadero Freeway. Photo taken 11/26/04. The Fremont Street (Exit 2C) ramp from westbound Interstate 80 is the final surviving section of the Embarcadero Freeway. The former ramp connecting I-80 east to I-480 north was closed and subsequently demolished during mid-2000s construction.